It’s no secret that individuals with autism struggle with communication, the ability to express their own emotions and understand the emotions of others, poor impulse control, and self-regulation, but few people realize that autism and sensory processing challenges tend to go hand-in-hand as well. From proprioceptive and vestibular system deregulation, to tactile, auditory, and oral sensory sensitivities, sensory processing disorder can have widespread impacts on a child’s development. It can negatively impact her ability to focus and retain material being taught in the classroom, cause gross and fine motor delays, increase emotional and behavioral problems, and lead to a lack of inclusion with her peers. We’ve already discussed the proprioceptive system and the vestibular system, and today we’ll be digger deeper into the oral sensory system, with a list of some super fun oral sensory activities you can do at home or in the classroom to help your child stay calm and focused, and regulate her emotions better. Sensory processing disorder, or SPD, is a neurophysiological condition in which the brain struggles to appropriately interpret and process information that comes from the body’s senses. It can cause some people to be over-sensitive to stimuli, and in others, it can make them under-sensitive. It can affect one sense or many senses, and since it’s not included in the Diagnostic and Statistical Manual (DSM), it’s difficult to help children who are affected by SPD. What is the oral sensory system? Our oral system allows us to communicate with others, and also allows us to chew, swallow, and experience different textures and tastes, but what few of us realize is that our oral system is also closely related to our proprioceptive system. For example, you might notice that your child is constantly chewing and biting things (oral sensory seeking behaviors), or your child might avoid certain food textures, have problems swallowing, and be very reluctant to try new foods (oral sensory avoiding behaviors). What are oral sensory seeking and avoiding behaviors? Parents and teachers are usually the first people to notice when something is amiss in children, and if your child seeks sensory oral input or tries her best to avoid it, she may be engaging in these behaviors to stay calm and focused, and regulate her emotions. If a child is under-sensitive to oral stimuli, she may seek out oral stimulation by chewing or sucking on things like pencils, fingers, hair, or clothing. She may have trouble chewing and/or drinking from a straw, bite her nails, hum, or make clicking sounds with her tongue. If a child is over-sensitive to oral stimuli, she may avoid anything to do with her mouth. Tooth-brushing may make her gag, she may be resistant to trying new foods and/or avoid certain textures of foods (purées, crunchy snacks, etc. ), and eating with utensils may upset her. These kids are often described as ‘picky eaters’ and may stick to a pretty limited diet they’re comfortable with. NOTE: The presence of these behaviors does NOT confirm a child has sensory processing disorder. Only a trained professional can make this diagnosis. Many children with autism display oral sensory seeking behaviors. They put their fingers in their mouths, chew their hair, bite their pencil, chew their clothing, and some even try to bite their classmates. Whichever way their need for oral stimulation manifests itself, it’s important to find ways to satisfy the need in an appropriate manner, but we must first understand WHY it happens. It’s not always possible to know the exact reason children engage in certain behaviors, especially when they are nonverbal and cannot express their feelings, fears, and struggles with us directly. But when it comes to oral sensory needs and autism, research tends to suggest that sensory seeking behaviors typically occur when a child is feeling anxious and/or overstimulated. Oral stimming can help promote a sense of calm, allowing greater focus and concentration, and since some oral motor activities (blowing bubbles, sucking through a straw, etc.) encourage kids to focus on their breathing, they offer a fabulous way to teach kids how to self-soothe and reduce feelings of anxiety and overwhelm. The trick is to find activities that are appropriate and socially acceptable. Whether your child has a confirmed oral sensory processing disorder diagnosis, or you notice she engages in oral sensory seeking or avoiding behaviors, an oral sensory diet – a series of physical activities tailored to your child’s specific sensory challenges/needs – can help her learn how to interact with her environment in an appropriate way. Here are 16 of our favorite oral motor activities for kids, which can be used in therapy, at home, or in the classroom. These activities will naturally soothe a child by encouraging proper breathing and providing the sensory input a child is seeking, and some will provide ideas for more appropriate self-soothing in times of stress, anxiety, and feelings of overwhelm. Make these Straw Rockets by Buggy and Buddy! Try this super fun Bubble Snake Maker by The Mad House! Got some Goldfish (the kind you eat) in your kitchen pantry? Then head on over to Making Merry Memories and learn how to catch Goldfish with straws! While these oral motor activities certainly provide appropriate oral sensory stimulation to kids who struggle with oral sensory needs, some children need a tangible toy or prop they can keep with them at all times to help them stay calm and focused, help ward off anxiety, and/or prevent them from engaging in inappropriate oral sensory seeking behavior throughout the day. If this sounds like your child, there are heaps of items you can purchase for this exact purpose. Here are 4 of our favorites! Sensory Chew Necklaces. I love these necklaces because they resemble a piece of LEGO (perfect for boys! ), they’re non-toxic and BPA-free, and they can be washed with water to remove bacteria at the end of the school day. Chewable Coil Necklace. If your child can’t tolerate a ‘pendant’ type of chew necklace, a coil necklace is a great pick as it’s extremely durable and the perfect size for kids. SWIRLY BANDS. If your child prefers to bite at her shirt sleeves, these coil bracelets will help save her clothes while still providing the sensory input she craves. Chew Brick Chewable Pencil Toppers. Can’t get your child to stop putting her pencil in her mouth? These non-toxic pencil toppers might be for her! Whether your little one has been diagnosed with sensory processing disorder, or you have noticed she either avoids or seeks oral sensory stimulation, these activities can help correct oral sensory imbalances for greater focus, concentration, and learning. This collection of oral motor activities for kids offers a fun, non-threatening way to provide the sensory stimulation kids need while also promoting a sense of calm and replacing inappropriate behaviors with more socially acceptable ones. 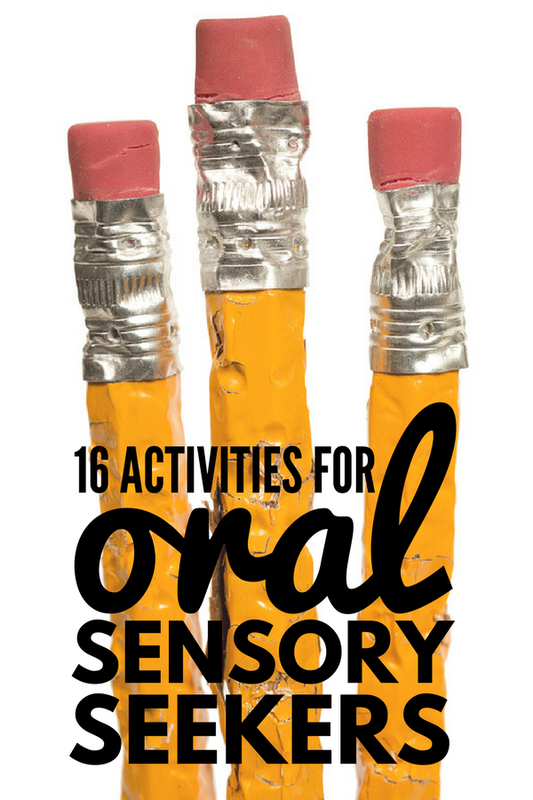 If you found this post about the oral sensory system as well as the oral motor activities for kids we included helpful, please share this post on Pinterest! And if you’re looking for more autism-related information, please follow our Autism & SPD board where we share all kinds of helpful information we find each day! Sensory processing disorder, or SPD, is a neurophysiological condition in which the brain struggles to appropriately interpret and process information that comes from the body’s senses. It can cause some people to be overly sensitive to stimuli, and in others, it can make them under-sensitive. It can affect one sense or many senses, and since it’s not included in the Diagnostic and Statistical Manual (DSM), it’s difficult to help children who are affected by SPD. Parents and teachers are usually the first people to notice when something is amiss in children, and if your child seeks sensory oral input or tries her best to avoid it, an oral sensory diet might help her stay calm and focused, and regulate her emotions. If a child is under-sensitive to oral stimuli, she may seek out oral stimulation by chewing or sucking on things like pencils, hands, hair, or clothing. She may have trouble chewing and/or drinking from a straw, bite her nails, hum, or make clicking sounds with her tongue. SENSO Sensory Chew Necklaces. I love these necklaces because they resemble a piece of LEGO (perfect for boys! ), they’re non-toxic and BPA-free, and they can be washed with water to remove bacteria at the end of the school day. Whether your little one has been diagnosed with sensory processing disorder, or you have noticed she either avoids or seeks oral sensory stimulation, these activities can help correct oral sensory imbalances for greater focus, concentration, and learning. This collection of oral motor activities for kids offers a fun, non-threatening way to give kids the sensory stimulation they need while also promoting a sense of calm and replacing inappropriate behaviors with more socially acceptable ones.